The Aquabiome Bead Filter is designed for koi ponds and water gardens. Aquabiome Bead Filter provides mechanical and biological filtration in a single housing. The Aquabiome ability to support dense populations of nitrifying bacteria and its reliability and easy maintenance, makes Aquabiome Bead Filters especially suitable for high density recirculation systems. The principal of using an Aquabiome Bead Filter is to combine the Biological filtration aspect with the mechanical filtration (water polishing). By combining these two filtration aspects (mechanical & Biological), using an Aquabiome Bead Filter, the whole system can be more compact than a traditional - conventional pond filter system. Or, the Aquabiome Bead Filter can also be used to enhance an existing system. In addition, the Aquabiome Bead Filter requires far less pressure than a conventional Hi Rate sand filter, therefore the type of pump needed will require far less power. Possibly reducing power use by 50%! Perhaps most important of all, an Aquabiome Bead Filter will require far less maintenance – cleaning or back washing than a typical Hi Rate pressure sand filter. This will mean you could save a considerable amount of wasted water and time, whilst keeping your pond in ‘tip top condition! How Does The Aquabiome Bead FilterFilter Work? The Aquabiome should be installed after your Sieve or main biological filter system. A suitably sized pump must be selected to ensure the correct water flow is delivered to the Aquabiome Bead Filter. Once installed, the Aquabiome will remove suspended solids down to 10 microns in size, maintaining your water clarity to a very high standard. The pumped water is fed to the Multi-port valve and diverted to the lower filter inlet. The inflowing water is evenly dispersed through the special slotted pipes (Laterals) within the lower section of the filter. The contaminated water flows upwards through the filter vessel depositing waste matter between the crevices of the Biomedia. To assist the growth of Bacteria for removal of the Ammonia present in the contaminated inflowing water, you will need to charge the system with: ‘Filter Start’. Once added to the inflowing water, good bacteria will begin to colonise on the filter media enhancing the biological action. The Aquabiome Bead Filter is designed to reduce the amount of maintenance (and waste water) required and ideally if the equipment has been correctly sized, backwashing will only be required on a weekly basis. The backwashing process is assisted by the use of a very powerful blower (air compressor) and the whole procedure will take less than 5 minutes to perform. (See general running instructions). 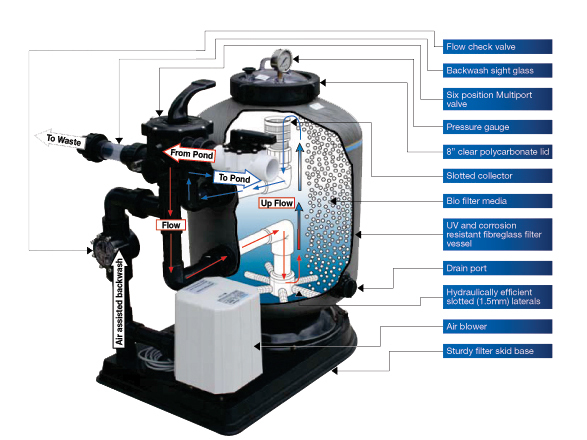 The Aquabiome Bead Filter is designed to ensure servicing simplicity. The main filter body has a large 8” diameter lid for easy access to the internals of the filter. Both the top collector assembly and laterals can be easily unscrewed and removed for cleaning. Excellent Nitrification and Mechanical filtration. Balanced slotted laterals to maximize water flow and filtration. To assist with backwashing, an air blower is provided. Its purpose is to agitate the Biofilter media prior to backwashing. Air is forced upwards through the filter’s laterals to break up the entire media bed and loosens the sediment trapped by the Biofilter media. The addition of an air blower reduces the amount of time and water required for backwashing and improves biological filtration capacity. A Multiport valve is provided as standard equipment with features such as Backwash, Rinse, Recirculate, and more. Aquabiome Filters can be backwashed hydraulically using water from your pond. Simply turn the multiport valve handle to backwash and your filter is hydraulically cleaned with water from your pond. Please note the below unit doesnt come with the beads so will breed to be ordered separately. Aquabiome is covered by a 12 month warranty period against faulty materials and workmanship.